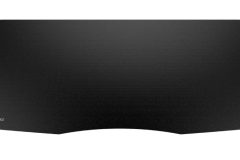 I’d seen the Mionix SARGAS 900 at a few of the RESPAWN LAN events and liked the surface but wondered if the 900mm width was “too wide to be practical”. Mionix gave me the opportunity to test it out and after a couple of months I’m a believer. PC gaming has been a hobby of mine since about 1991 but it wasn’t until about 1997 & 1998 with the release of Quake 2 and Half Life respectively that I started to care about my mouse surface. 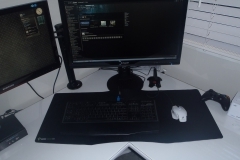 Back then, the concept of using a 900mm wide mouse mat was a joke and out of habit, I’ve been using mouse mats around a square foot in size or smaller until now. 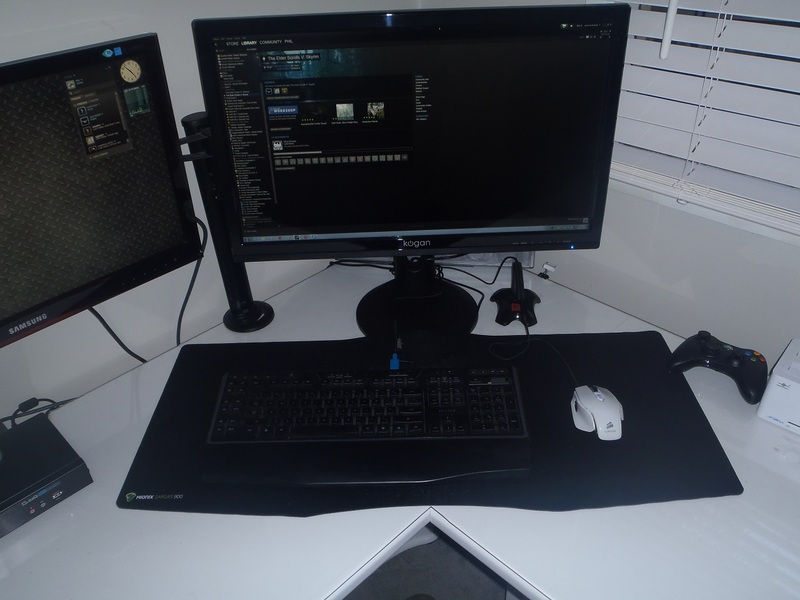 So, in 2014 thanks to Mionix I’ve seen that the grass is truly greener on the other, wider side. 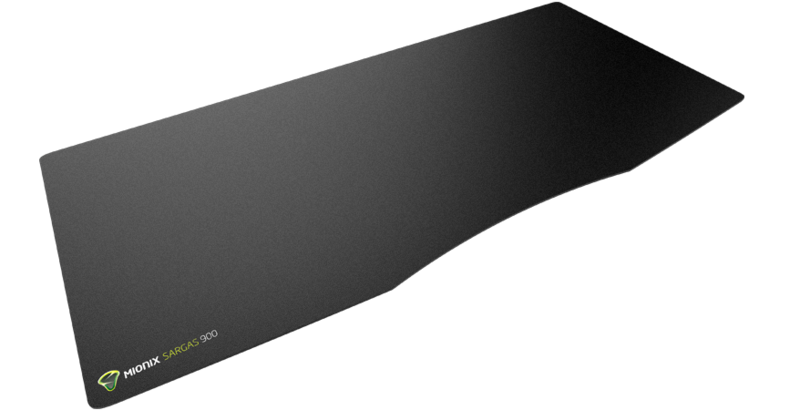 The Mionix SARGAS 900 is a ‘cloth’ desk pad with a microfiber top surface and a natural rubber backing that goes under your keyboard and mouse – the surface itself is fantastic for laser tracking and gaming. 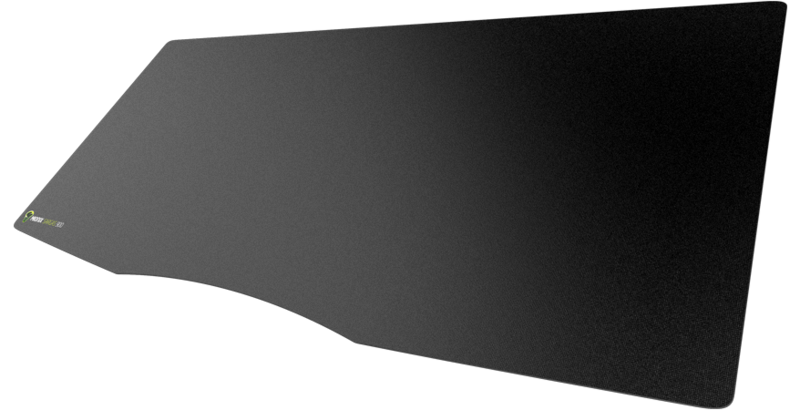 After seeing the claims of Optimal Tracking, Maximum Grip and Smooth and Controlled I was keen to see how it fared against my previous mouse surface, the Roccat Alumic HardPad. The first thing I noted was that although there was still friction under the mouse, the SARGAS 900 is not abrasive like the Roccat Alumic. Textured metal mouse pads are good for tracking but if the texture is too abrasive, it can act like sandpaper on the underside of your mouse and scratch it up something shocking. This was an issue with the Roccat Alumic but not with the Mionix SARGAS microfiber surface. The claim of maximum grip holds true as well (pun intended). The deskpad stayed where I left it but was easy to lift from an edge or corner on the odd occasion that I wanted to move it. 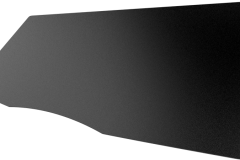 Finally, mouse movement on the SARGAS surface was smooth with enough friction for the feedback of movement when gaming – it took less than a week for me to decide that I couldn’t go back to the Roccat Alumic Hardpad. The packaging is really simple, Mionix roll the SARGAS 900 up and pack it in a box for retail. I was initially concerned that rolling the deskpad up would cause it to lift in the corners or ripple but it wasn’t an issue at all. One unrolled and layed out flat, there was no sign at all that it had been packed, stored and shipped in a rolled up state. 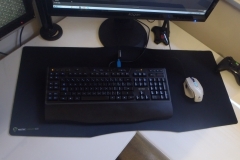 I made the switch from my Roccat Alumic Hardpad to the Mionix SARGAS 900 and used it every day for about 2 months. 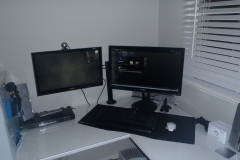 This included web browsing, website work and gaming. The testing methodology here was the most basic of anything I’ve ever tested. At the end of 2 months, I found that any random specs of dust etc. brushed off easily and that the SARGAS 900 isn’t a lint or fluff magnet as I had initially feared. There were no visible signs of wear after 2 months – nor would I expect there to be. The corners were still flat on the desk and the mat was able to be lifted off without any ‘sticking’ the the Perspex top of the desk underneath. Being only a couple of millimetres thick, the SARGAS 900 didn’t impact on the ergonomics of my desktop setup at all. 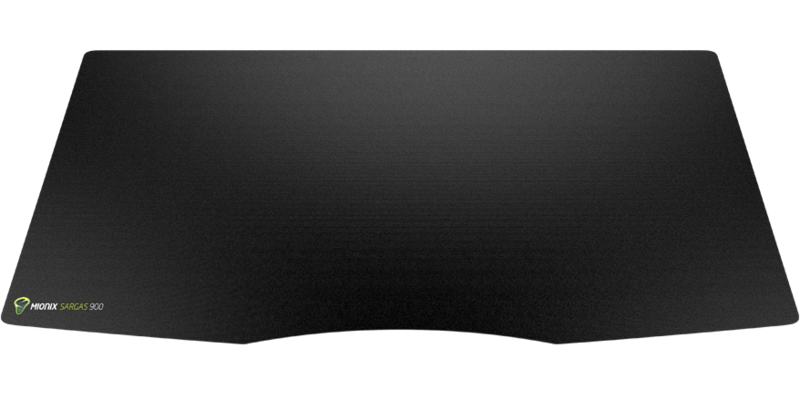 The surface remained smooth and without any rippling at any time. 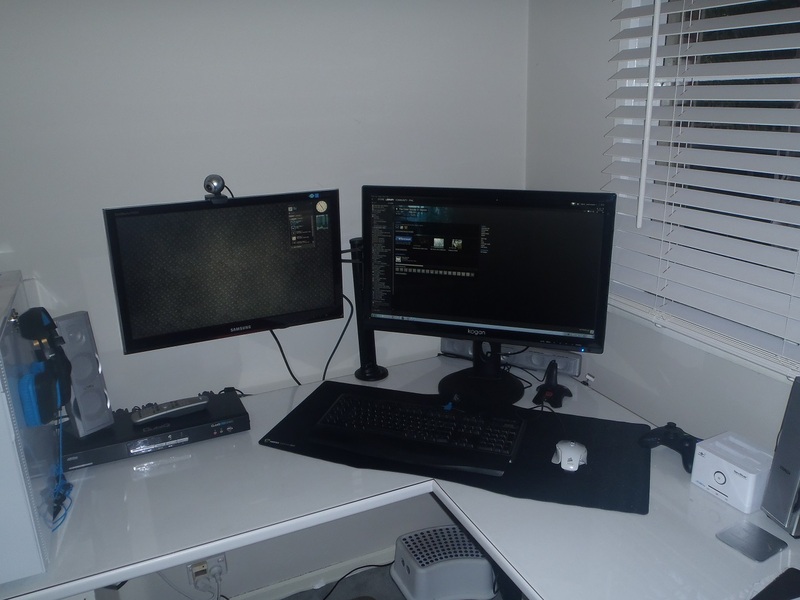 In the gallery below you can see the Mionix SARGAS 900 on my desktop with the Logitech G110, Corsair M65, Tt eSPORTS Galeru mouse bungee and XBox 360 controller – it takes up a fair bit of space but that’s also the ‘work area’ that needs to be clear of clutter anyway. The black mat is plain enough to go with most desktops and if anything, it makes the backlight on the keyboard stand out more. As usual, we tested this with our ASUS test bench – specs below. Although less relevant for a deskpad, we like to be consistent – All testing was done on a dual monitor setup of 1920×1080 and 2560×1440 so there was a lot of mouse movement across the displays. It’s reasonably priced at $25 online – there are other wide mats available for around the same price or a couple of dollars more. 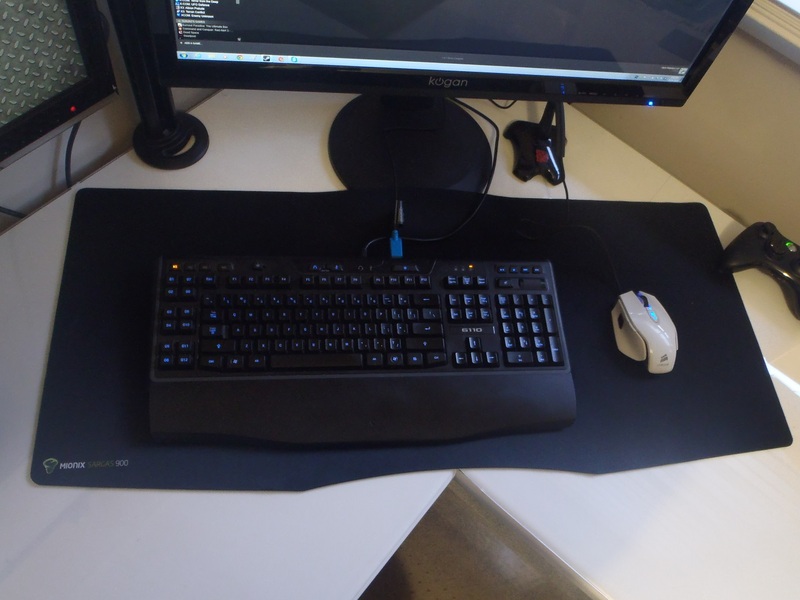 I liked the Mionix SARGAS 900 from the first time I used it and had no hesitation switching from the Roccat Alumic Hardpad. Having the keyboard and mouse on the same, wide microfiber surface is great and I wish I’d made the move earlier. 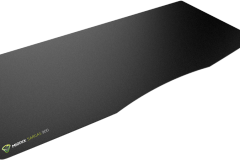 The surface and backing are spot on and although Mionix could probably have gotten away with 800mm wide, the 900mm SARGAS works well and means that you have more working space dedicated to your gaming. I like the fact that the branding is subtle and you could match this product with most themed desktop peripherals and monitors.